'Competition in this repertoire is pretty formidable...but the London Winds are second to none in terms of technical accomplishment, expressive commitment and warmth of timbre'. London Winds is renowned for its excellent interpretation of new music, and at the 1991 Norfolk and Norwich Festival they gave the world première of a specially commissioned piece for thirteen winds - by John McCabe. This work uses the same instrumentation as Mozart's Serenade for 13 Winds. 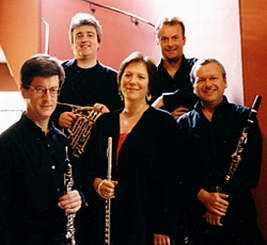 A new commission by Robin Holloway for wind octet, was premiered at the Cheltenham International Festival in July 2001. London Winds has made several recordings, the latest of which is their 'party piece', Mozart's Gran Partita K361, coupled with the K388 Serenade on ONYX. Their György Ligeti complete wind music recording for Sony Classical (part of their Ligeti Edition) won the Preis Der Deutschen Schallplattenkritik and was nominated for a 1999 Grammy. The ensemble has also recorded the complete set of Richard Strauss Wind Symphonies for Hyperion, and Beethoven's Quintet for Piano & Winds and Spohr's Septet for Decca, with Pascal Rogé and Chantal Juillet.